I have some property that I've financed through a land-contract company. It can be very difficult to get a traditional type mortgage on undeveloped rural property and my current loan either comes due as a balloon payment (6 years worth of $$$ in one lump sum!) or may be continued at the discretion of the lender in March. Until the past year my payments have been prompt and exceeded the minimum due; however, in the past year my payments have occasionally been late, although always paid within the calendar month. My concern is that the company may rescind my loan -- it is unlikely I could secure a loan for the balloon payment and would in effect, lose 5 years' worth of monies and improvements to the road and such. The land company could then re-sell the land to someone else; I am worried that this may be an attractive option to them. It would unfortunately be within their legal rights as my contract is written; it is entirely at their discretion to refinance or not in March 2010. I researched the company before making the deal originally and this doesn't seem to be their modus operandi...but still the idea is there, worrying at my mind. I plan to begin working this situation within the month. I see LM sells a honey jar specific to this situation. Has anyone here used this kit and what sort of results did you have? I am considering the kit, but the contents are not well detailed; I'm sure the quality is high but I really want to make sure I have all bases covered as this is vitally important to me. I would also like to begin dressing my payments with an appropriate sachet powder -- any suggestions, anyone? I plan to go out and nail down the (numerous, 50 crooked WV acres worth) corners of the property very soon. I have also considered the High John spellkit to make a mojo hand with the intention of giving me the upper hand in the upcoming negotiation. Forewarned is forearmed and I want to make sure I am doing everything I can to ensure a favorable outcome. I am open to any and all ideas -- product suggestions, vigil lights, rituals, petitions to Saints -- and would very much appreciate feedback from anyone who has successfully dealt with a similar situation. Im not one for money so I cant give much advice.. though some thing that pop to mind is using crown of success when you negotiate. i love honey jars, i know them for love working, though my grandma use to keep some sugar on a pile of money as she said money is like a little kid it loves its sweets. so I think its a good option to make them like you and more open to you. a plus is they dont normally do this so id not think it be their first through to do it. i really would suggest a reading from a reader who can tell you whats currently going on and what will happen, then suggest work to be done specific to your needs such as spells to cast, powders to use, candles to light. I know often we think we know all the aspects, then we get a reading and realize wow i never looked at it that way. I think St. Jospeph would be good in this case, take some dirt from the property and use it with the candle in prayer to help secure it for you. I highly recommend using 5 Finger Grass with anything regarding bank loans. Dress any candles, powder any papers, etc. Best of luck to you! Thank you, Mother Mystic. Cinquefoil is used extensively in the Appalachian hex tradition I grew up with and I will certainly take your advice. It is such a wonderful plant, a real gift from the Maker! Hi, j82. I had not considered a professional reading, I usually do my own divinations; however, I agree this would be a good time to seek an outside perspective. Thank you. As for your grandma's sweet money, did she use sugar cubes or just loose sugar? In my family we sometimes lightly dress money with cinnamon oil for a similar effect. I had also thought St. Joseph might be appropriate for this situation since it deals with real estate. I think St. Martha might be good to help me exert my will but I have yet to do any work with her. I am only recently reclaiming the Christos aspects of the magickal tradition I practice after years of rejecting it altogether. Last month I made my first petition to St. Expedite and have been so pleased with the assistance he afforded me. Does anyone know what type of ritual oil is included with the Loan Re-Fi honey jar kit? It is not pictured on the website and if I purchase it I will probably also get some of the companion products as well. Some other herbs I thought to use are calamus, licorice root, alfalfa and perhaps alkanet. If anyone has knowledge of an effective conjure ritual for this type of situation I very much appreciate any input. Also, I'd love to hear of any success stories regarding the use of railroad spikes to nail down property that was under the threat of foreclosure. My place is still securely mine at this point, but again, I feel a strong need to allay my concerns and be proactive in assuring come March I have no problem refinancing. Thanks to all for your time and insights. It is Money House Blessing Oil. By the way, my grandma used regular sugar for this and normally sprinkled a little on it when she was baking. I have only used L.M. 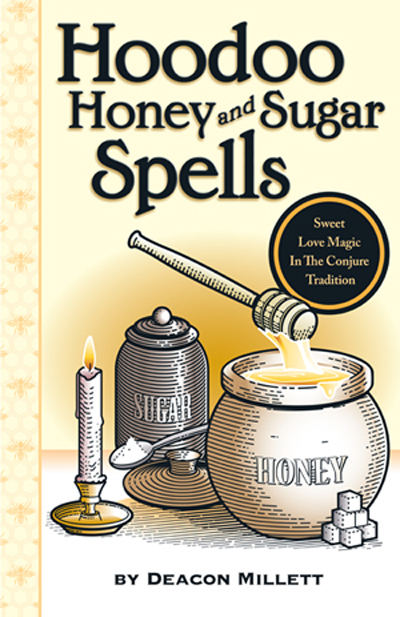 Spell kits in the past but have researched a lot of the archives on House Blessing protecting and Money House Blessing over the house hold. But there is no kit for that specifically? What product, or kit do I use for that? A Blessing Kit will work nicely to bless a home. 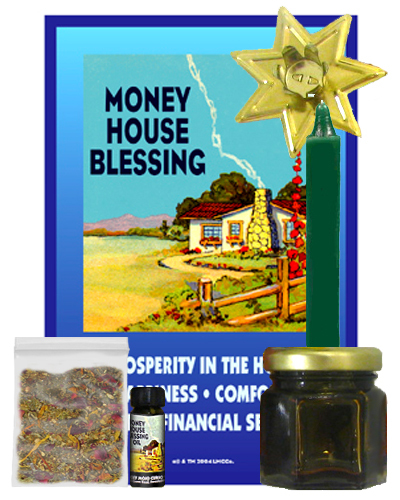 You can combine some Money House Blessing oil with the Blessing kit products, or you can individually buy some Money House Blessing crystal salts, incense and oils. You can dissolve the Money House Blessing salts in water and wash the floors of your house, praying your intention. You can burn the incense and dress the doors and windows with the oil. We have a Money House Blessing honey jar kit. It is listed as "Forestall Foreclosure" but is good for blessing the house with money. From personal experience, I can attest to the Money House Blessing and Blessing Spiritual products. You might consider the 7-11 Holy Miracle which could be a nice touch. All of them are wonderful for blessing your household. This is the Honey jar for Money House Blessing, Loan Modification, Mortgage Refinancing, Lease Issues, and Forestalling Foreclosure: It is for dealing with banks, title companies, loan companies, and others whom you wish to sweeten in financial matters with regard to yur home, wither rented or owned. I have a question for the oil that is listed on the web link to what I found. Just wanted to make sure it is the right thing. Here's what I have in my cart, for the wash I already have a Chinese wash that I have used and love. CAN-GLS-MONH and Peace Water, 4 oz. After reading I found that I should and will be doing a Money Stay with me kit. I'm going to add some Attraction Incense Powder and Attraction Sachet Powder. Thank you jwmcclin. I have placed my order and cant wait till it arrives. amodu11, I recommend the Money House Blessing kit that I bought. I can see a difference in money matters as well as being able to resist spending money. Sorry, I spoke to soon. I got the Money Stay with Me Kit (husband and I had been told his ex wife jinxed his money), and I also got the Money House Blessing Glass fixed candle. The MHB candle is less expensive than the kit. I would see the descriptions on both of the products and then decide which one best suits your needs. I looking for a strong magic to have money and a house. I'm working but the money I m earning is not enough to buy a house. My family and I just moved in this nice house in January 2017 , the land lord wants to sell the house he is giving us a chance to buy it, but mine and my husband credit is bad, we really want this house, it is very affordable and it is not like a struggle to live here. What is a good spell for this , we want things to be turned around for us so that we can buy the house. I hope you get that house!